Porsche 911 Carrera 2012 took off the covers at the Frankfurt Auto Show 2011. Continuing to showcase its sleek and stretched sihouette, exciting contours and precisely design features, this 7th generation 911 Carrera has a 100mm longer wheelbase, reduced overall height and 100 lb weight reduction. The all-new Carrera completes the sprint in 4.4 seconds and has a top track speed of 188 mph. ATLANTA -- August 23 201 - At 48, the Porsche 911 Carrera is younger than ever. The completely redesigned seventh-generation sports car icon is stepping into the limelight with its sleek and stretched silhouette, exciting contours and precisely designed features. Yet from every angle it is unmistakably a 911, holding true to the Porsche 911 Carrera 'evolution, not revolution' design philosophy. The 100 mm or 3.9 inch longer wheelbase and reduced overall height underpin the fresh, athletic yet elegant appearance. When viewed from the front, the eye is drawn to the 911's trademark wide- arched fenders, emphasizing the wider front track. The side mirrors are now mounted on the upper edge of the door, which also helps highlight the new design line and gives the visual impression of width. The new lightweight body is an aluminum-steel composite construction and contributes greatly to the 45 kg or about 100 lbs weight reduction when compared to the previous 911 body. When combined with the greater structural rigidity and optimized aerodynamics – including a wider, variably extending rear spoiler – the new 911 Carrera’s front and rear lift has been reduced to near zero while retaining the Cd value of 0.29. To complement the modern exterior design, Porsche designers created an interior reminiscent of the Carrera GT. The driver is now even more closely integrated within the cockpit thanks to the rising center console and high-mounted shift lever or gear selector located close to the steering wheel. As with the exterior, classic Porsche elements abound inside. Present is the instrument cluster with five round gauges – one of them a high resolution multifunction screen, and of course the central tachometer and the ignition lock to the left of the steering wheel. Setting the standard in its class, as it has for generations, the new 911 Carrera and 911 Carrera S raise the performance and efficiency bar yet another notch. All versions get by with significantly less than 10 liters of fuel per 100 kilometers (official U.S. EPA fuel mileage estimates are TBD) and fuel consumption and emissions are up to 16 percent lower in the New European Driving Cycle (NEDC) when compared with the predecessor. This is achieved through systems such as the Automatic Start Stop function, engine and transmission thermal management, electrical system recuperation, the world's first seven-speed manual transmission and – in conjunction with the Porsche Doppelkupplungsgetriebe (PDK) – the ability to 'sail' or coast. The new electro-mechanical power steering offers not only Porsche's typical precision and feedback but also helps increase efficiency and reduce fuel-consumption. For example, the 911 Carrera with the new 350 hp, 3.4-liter boxer engine and optional PDK consumes 8.2 l/100 km based on the NEDC – 1.6 l/100 km less than its predecessor. The 911 Carrera S with its 400 hp, 3.8-liter boxer engine – 15 hp more than before – achieves 8.7 l/100 km in the NEDC when paired with the optional PDK transmission. This represents a fuel consumption decrease of 14 percent or 1.5 l/100 km. At the same time there are performance improvements in both models. 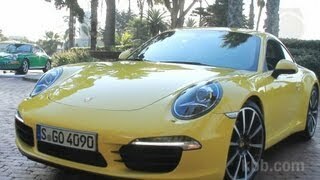 The 911 Carrera S with PDK accelerates from 0 to 60 in 4.1 seconds. Using the Launch Control function of the optional Sport Chrono Package cuts that to 3.9 seconds. The 911 Carrera with PDK needs only 4.4 seconds to sprint from a standing start to 60 mph (4.2 seconds when using the optional Sport Chrono Package’s Launch Control function). 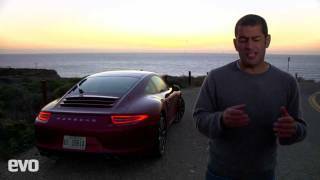 Top-track speed for the 911 Carrera S and 911 Carrera is 188 mph and 179 mph, respectively. The new 911 offers both better longitudinal dynamics and unprecedented top performance in terms of transverse dynamics. In addition to the longer wheelbase, the greater agility, precision and driving stability are based, among other things, on the wider front track, the new rear axle and new electro- mechanical power steering. Depending on the model, there are other standard or optional active control systems available that can help further enhance the overall driving dynamics. 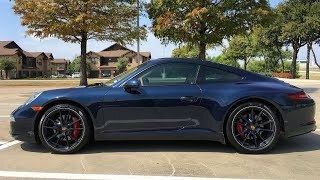 That is especially true for the Porsche Dynamic Chassis Control (PDCC) active roll stabilization system, available for the first time on the 911 Carrera S. The system helps reduce lateral roll when cornering and helps keep the tires in the optimal position relative to the road surface. The new 911 further extends the span of seemingly contradictory attributes such as performance and efficiency, sportiness and every day practicality that have always typified the Porsche 911. That makes the 911 Carrera more of a 911 than ever. The new Porsche 911 Carrera celebrates its world premiere at the 2011 IAA Frankfurt Motor Show in September. 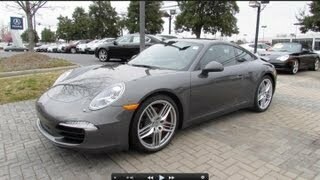 The first new 911 models will arrive in U.S. dealerships beginning in February of 2012. The new 911 Carrera Coupe will have a base MSRP of $82,100, while the 911 Carrera S Coupe’s base MSRP will be $96,400 (excluding destination). Both models will include substantial additional equipment when compared to the previous models.